5G is simply an abbreviation of the fifth generation of wireless mobile networks, which is a name for the next round of wireless communications and mobile network infrastructure to be developed and deployed. Unlike previous mobile wireless generations however, 5G has been swept up in a union of visions of a technology enhanced future. Of these lofty visions is the idea that the whole world, and the region of space near planet earth, will be connected by an extremely high-speed, low latency, extremely reliable, energy efficient, and low cost mesh of wireless devices. Beyond the buzz and the countless 5G prophecies are the performance aspirations hoped for in the next 10 to 20 years. To some, these goals are also predictions of the inevitable direction market forces are steering wireless networking technologies. The backbone of this proposed ubiquitous network is networking infrastructure, wireless radio technology, sensor devices, data storage, or data processing systems. All of which must be designed, manufactured, and tested to a precision and scale only before seen with cutting-edge electronic warfare (EW) and signal intelligence (SIGINT) technologies. There are four main areas of focus for 5G technologies to exceed the capability of prior generations of wireless communications technology: capacity and coverage, latency and reliability, energy consumption and cost, and improved access technology/infrastructure. At which stage of the possible 20 year lifecycle of 5G each of the proposed enhancements will occur depends upon the market and policy factors, along with the pace of technology development. Much of the current research and development has focused on specific implementations of desired 5G features that fit the business goals of the companies sponsoring the efforts. For example, many cellular service providers and wireless mobile hardware manufacturers—Samsung, Verizon, Huawei, etc.—have demonstrated extremely high-speed data links using carrier aggregation, multi-input multi-output (MIMO), antenna arrays, and new digital modulation strategies. Other companies, such as Facebook and Google, have focused their efforts on development technologies and systems that provide ubiquitous wireless Internet access, even in remote rural areas. And yet others, such as Amazon, Microsoft, and Google, have invested in developing more accessible cloud services platforms and data management systems to help herald the use of powerful, and connected, computing resources in the palm of everyone’s hand. It may be several years, or even beyond a decade, before some of the proposed 5G features reach into everyday life. This may be especially true for the more involved aspects of radio access technologies and infrastructure that enable the latency, reliability, coverage, connections, and hardware/service costs necessary to meet 5G expectations. The sections below will summarize some of the key perspectives on 5G requirements and discuss some of the necessary technology improvements for realizing relevant 5G capabilities. 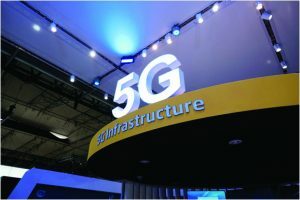 Ideally, 5G will bring a seamless user experience that bridges cloud services, a multitude of diverse sensor nodes, personalized data analytics features, and real-time video/audio to users’ many devices, and without a user having any knowledge or expense of effort in the minutia of setting up such a system. Beyond the raw speed need for 4K mobile video viewing, 5G service customers would also have reliable connectivity anywhere they went, which enables interaction between a customer’s connected local environment and their user preferences . Additionally, a 5G user would have access to powerful cloud computing tools at very low latency, as to appear to be real-time. These features would be affordable and pervasive enough that virtually any user could afford connectivity for their smartphones, tablets, computers, TVs, accessories, and distributed smart devices throughout their home, car, and work environments. Another growing area of interest that 5G may enable is portable augmented and virtual reality (AR/VR) technology. Current augmented and virtual reality systems require expensive and power-hungry processing hardware, often in the form of a dedicated high performing PC. High-speed and low latency data links from AR/VR headsets to locally distributed data processors or other connected users could enable virtual tactile interaction features, not too dissimilar from a Star Trek holodeck . In order to provide these features at the necessary level of user-friendliness, a much higher level of integration and cooperation among a range of wired and wireless networking services must be made . For example, in order for a mobile device to connect to other devices, the equipment must be connected to either a Wi-Fi, Bluetooth®, NFC, or a cellular network. These networks are distinct and require entirely different radio hardware, antennas, and modulation techniques to function. Moreover, accessing many of the networking features of a mobile device, such as a smartphone, can’t feasibly operate simultaneously without a reduction in performance. For a small and low-power portable device to be able to smoothly connect with the other devices around it, such a device would require fast, efficient, and intelligent radio architecture that can adapt its transmission and reception characteristics to the tasks it’s fulfilling and RF environment around it. Considering the suggestion that handheld smart devices may require capability to operate in the millimeter-wave bands, compact electronically-steered antenna arrays that can accommodate frequencies from hundreds of megahertz to tens of gigahertz would be necessary. Systems with such capability currently don’t exist outside of the military—Raytheon’s next generation jammer technology—satellites, and cutting-edge research applications. Currently, different wireless service providers use different portions of spectrum and modulation schemes. These are both hardware, firmware, and software-based setups. For the low-cost hardware and access to be achieved given these factors, either highly reprogrammable firmware technology, such as software-defined radio (SDR) or cognitive radio, and/or reconfigurable RF-front end radio technology, will be required. These factors coincide with techniques that may help to manage the incredible amount of spectral clutter that exists, and will only increase, in the sub-6 GHz RF bands. Though building this capability into a mobile device will be challenging enough, the base station/router technology supporting these features will need to be able to simultaneously service tens to hundreds of these devices. Another perspective is the need for a network protocol that can best serve both extremely high-data rates with low latency for active user devices, or very low-power, short, and critical transmissions from low-powered sensor node devices. There have been several mesh protocols proposed, such as Thread, that are based on a single network protocol that allows for devices to operate in several different modes based on the network and device’s current activity and requirements. Another key parameter of 5G is to be able to provide low-latency wireless services that can support multiple vehicles traveling at up to interstate speeds. This type of communication would involve supporting inter-vehicle (V2V) machine-to-machine (M2M) communication and vehicle-to-infrastructure (V2I) communication with traffic, public safety, and emergency services . Telematics entertainment features, akin to what a user would expect on their own mobile devices in their home, have also been suggested which would require even more sophisticated radio hardware and a wireless link between a vehicle and network (V2N). 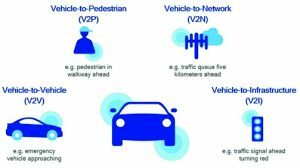 Lastly, to ensure safety and enable autonomous taxi and fleet vehicles , pedestrian-to-vehicle/vehicle-to-pedestrian (V2P) communication is also a desirable output of 5G encompassing automotive transportation. The high speeds at which connected commuter and fleet vehicles would travel require a network topology and radio architecture that is so well integrated into the traffic infrastructure, wireless capability, and control systems of a vehicle that there is very little delay among these connections. In order to avoid potentially disastrous runaway conditions, intercommunication latency would need to be at least down to 1 millisecond, and virtually always reliable. For self-driving or autonomous cars, this could mean the difference between smooth and uninterrupted traffic, and life threatening multi-car collisions. One of the biggest challenges of this approach would be implementing the ability to rapidly, and securely, establish a mesh network connection among the various vehicles on the road, whatever local traffic infrastructure there is, and the local network service. To reduce the latency and ensure the level of reliability necessary to be safe, each vehicle would need to be able to intercommunicate seamlessly with a common low-latency M2M standard, while mitigating/avoiding the effects of any accidental or intentional interference. Beamsteering antennas, interference-resistant radio hardware and techniques, and integrated multi-domain sensor technologies are all suggested as methods to ensure driver, passenger, and public safety under such conditions . Active electronically steered antenna arrays (AESAs) have been increasingly adopted in military radar and critical communication links, especially at high microwave and millimeter-wave frequencies. As a product of the rapidly controllable antenna directivity and reduced scale at high frequencies, AESAs are regarded as a solution for vehicular radar and communication systems less susceptible to interference. Frequency hopping and/or extremely broadband/multi-band communications hardware could also be used to avoid interference and increase the reliable uptime of critical V2V and V2I connections. Additionally, with highly integrated sensors and radio systems sharing data among surrounding vehicles and traffic; infrastructure could be used to automatically create intelligent contingency plans on the fly that could account for virtually all traffic scenarios. 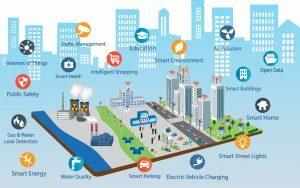 Unlike personal mobile devices and autonomous cars, 5G support for smart homes, smart cities, and smart factories won’t necessarily need to support tens to hundreds of data hungry devices. Instead, the wireless network of the future will need to support thousands of low-power, diverse, and inconsistently spaced sensor nodes and control devices. This type of communication may mostly be M2M, with some devices constantly communicating high priority sensor readings, and some intermittently signaling or receiving instructions via highly efficient protocols [1,2,6]. Some of these devices may communicate solely to dedicated hubs/routers, while others may operate as part of a mesh network. Not all of these standards are optimized for the type of communication these devices require, namely with battery consumption. For low-power intermittent communication/operating devices, 5G as a solution is proposed that would enable up to 10 years of battery life for remote and low-duty cycle devices [7,8]. Currently, home automation and smart home systems use a series of Internet connected hubs, which are connected via the home Wi-Fi router. Or, these devices require manual control through Bluetooth, Wi-Fi-direct, Zigbee, or even proprietary frequencies and standards. Many industrial, municipal, and utility autonomous or wireless devices operate via similar connection systems, with custom hardware, software, manufacturing processes, and testing. Typically, these systems don’t integrate well with each other, and require installation, maintenance, and troubleshooting that is unique to the particular wireless system . Cost, flexibility, power, and coverage are the main concerns for implementing true IoT/IoE or Industry 4.0 platforms in homes, cities, or factories. Current standards for consumer low-power home automation devices have a short range of only several to tens of meters, have battery lives of only a few months, aren’t as reliable as non-smart systems, cost more than most homeowners can afford as a luxury, and require specific installation and setup for each individual system. To improve on this, wireless network architectures and protocols that can account for various types of transmissions while operating on a common standard with mesh capability would be necessary. Highly integrated and reconfigurable radio ICs that can be produced on a massive scale and be used for a wide range of devices would also help to reduce costs and increase interoperability between consumer and industrial automation systems. Hence, this solution would require a complete SDR system-on-chip (SoC) at price points over a hundred times cheaper than current solutions. Modern technology with these capabilities is currently targeted toward military or commercial high-speed digital telecommunications systems or prototyping, and is not suited for consumer and commercial use. 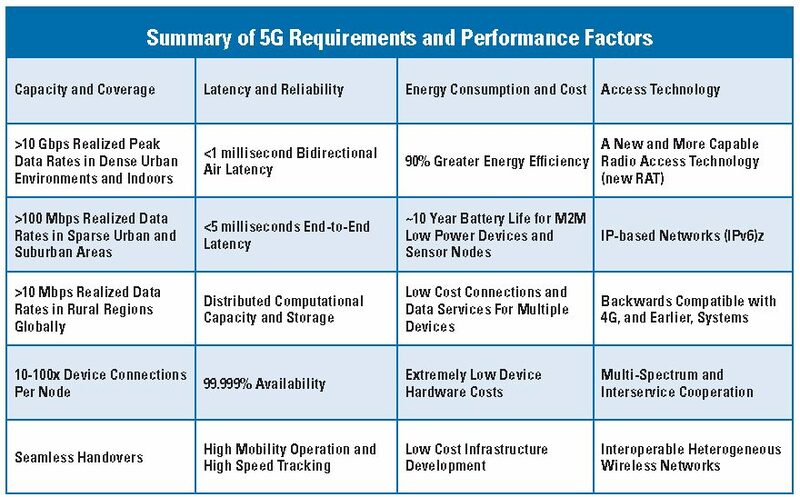 The generally accepted expectations for 5G mobile wireless capability place a burden of performance and features on RF/microwave hardware, techniques, and testing requirements that may even exceed many current military and defense technologies. This may be so, as military and defense technologies are often produced in small, custom designed, manufactured and tested volumes with less stringent cost-per-unit constraints. For example, several technologies previously developed for military and defense applications that are being experimented with for high performance wireless systems include active antenna arrays, MIMO radio architectures, transceivers with bandwidths into the gigahertz, fiber optic interconnect, millimeter-wave communications, software-defined radio technology for portable devices and base-stations/routers, mobile base-stations/routers, mesh network typologies, and custom test systems designed for a single application . Therefore, significant design challenges lie ahead for design and system engineers to integrate these technologies into interoperable platforms that intelligently connect to local and global networks and are affordable to the mass market [11, 12]. Figure 5: Wireless functionality is being incorporated into consumer, industrial, and military devices that may never have been connected before. Also, current wireless devices are also being upgraded to newer standards and capabilities, increasing the volume and complexity of testing these wireless devices for quality control and compliance. For example, to develop active antenna arrays for a base station that can provide the flexibility and performance necessary to supply high-speed data to multiple and moving user devices, the array would have to have active beam steering and beam tracking capability. These features would require the RF transceiver and RF-front end components, along with supporting digital processing (field programmable gate arrays (FPGAs) and powerful microprocessors), and a low latency backhaul link that would run at tens of gigabits-per-second. In essence, this system would require even greater capability than a modern microwave backhaul link at a fraction of the cost and size. Each element of an active antenna array would require a complete RF transceiver to accommodate various data streams, as proposed with massive multi-user MIMO (mu-MIMO). Where previously the RF-front end, transceiver, modulation, digital baseband, and processing occurred in different assemblies, a proposed 5G system may require integration of all of the necessary base station radio components in a single assembly. One justification for this level of integration would be to enable the necessary interoperability and data-throughput required for such an agile system. Another is integration that could lead to reducing cost, size, and power consumption to levels that a service provider, and a mass market user, could afford. Also, testing such a system may require a sophisticated over-the-air (OTA) testing platform that would have to exceed the performance capability of the device-under-test by large enough margins to characterize the device’s behavior [13, 14, 15, 16, 17]. Such complex devices and integrated systems could potentially generate such a large number of states that complete testing wouldn’t be feasible to perform accurately in a timely fashion, or far too expensive. Additionally, evaluating the amount of data such testing would produce would require systems similar to Big Data analytics, as it would be more than a team of engineers could handle. If SDR capability, and even cognitive radio technology, are also employed, then the number of states becomes essentially infinite, and testing a single radio device, let alone several, becomes a much greater challenge. 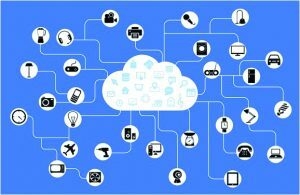 An additional factor to consider will be the need to test millions of highly capable, specialized and reconfigurable, IoT/IoE devices that may need to rapidly change with tidal market forces. The cost-per-test for such devices will need to decrease, and test capability and speed must increase. Increasingly, modular test systems that can be rapidly reconfigured almost as rapidly as the devices they are testing are being deployed in large scale manufacturing and quality testing of high-volume electronic devices. 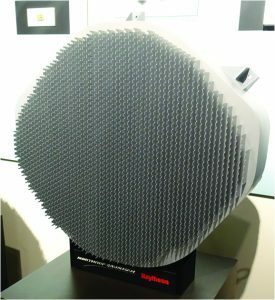 In order to scale the RF/microwave modular test systems to be able to respond to the potential for extreme frequency, reprogrammability, agile antennas, and adaptable modulation devices-under-test, current technologies will need to enhance the key performance parameters manyfold in just the next few years. The high and aggressive expectations for the next generation of mobile wireless networks and services, 5G, is driving an explosion of research and development in more capable RF/microwave radios and systems. To maintain, and even increase, this rapid rate of development, access to up-to-date and quality RF/microwave interconnect, passive components, active devices, and assemblies must be as efficient as possible. Many RF/microwave manufacturers and distributors operate off quote-based and made-to-order components and devices. However, the lag time and potential for delay with such systems could inhibit the progress of start-ups and new/reinvented business units seeking to capitalize on new market possibilities. Fortunately, there are RF/microwave component companies that stock these necessary components and devices and have systems in place to rapidly ship parts with the ease and accessibility of online ordering. To provide an even greater edge for their customers, some of these suppliers also staff engineers and expert technicians to aid customers with the ideal product selection to fit their specific project requirements.